Lisa is the mother of 3 gifted children and lives outside of San Francisco. There is a right way to approach your school work and a wrong way. The right way is to plan ahead, break the project down into manageable pieces, allow enough time to proofread and edit your work and make sure the final work product looks good. The wrong way is to wait to begin until the night before the project is due, handwrite it (neatly at first, and nearly illegibly by the end) on the pages of a notebook and stay up all night completing it. My middle son took the second approach. But this isn’t a story about getting my son to do his homework the right way. This is about learning to accept his way. To properly tell the story of my son’s “wrong way” project, I have to go back to the spring, when I attended the Bradley Seminar with my son. All of the attendees completed a Myers-Briggs Type Indicator (MBTI) and learned about their personality types and their underlying characteristics. The facilitator asked the parents and students to line up on various sides of the conference room to join others with the same “type”. For the most part, my son and I were on the opposite sides of the room (no surprise). Most of our differences I understood, except one: how we deal with the outside world. I am a “judging” type. He is a “perceiving” type. This difference turns out to be a big one for us. Judging types like to plan and prefer an orderly life. Perceiving types are flexible and open to new experiences. Perceivers are enervated by deadlines. They take in information until the last minute and then complete their work in a burst of energy. Once I realized that my son was not going to share my love of lists and schedules, I stopped monitoring his work habits. I gave up on encouraging him to complete his school work in the right way. The way my son completed his final project for his English class embodied his perceiving nature. The prompt for the project was “What is your American Voice?” My son decided to write his memoir. It would be in the form of a diary, written in a journal. He chose to write it in a red leather journal he purchased on a family vacation in France. He began the project the evening before it was due. He completed the 86 page memoir during his study hall, an hour before his English class. It’s lovely, really…Your book is remarkably well-written for someone who just sat down and started writing. I guess writing isn’t ALWAYS rewriting. You have a natural gift for storytelling. In this instance his natural work style worked for him. This is often the case. His rapid intellectual processing, long attention span and excellent memory allow him to produce quality work in a condensed period of time. There are instances, however, when his last minute burst of energy and inspiration isn’t enough. Last week he started running with the cross country team after not running all summer. On the third day, he injured his knee. His body was telling him what his English teacher did not: some tasks require the slow and steady approach. My husband talked with my son and tried to make the connection between his preferred way of doing things and the possible consequences of his work style. His English project worked out because he is a good writer and he spent weeks crafting the story in his head. He likes to immerse himself in a burst of creative concentration. He also knew the teacher well. His knee reminded him that he cannot always be successful doing what is most natural for him. Running, like other skills (for example, music and foreign languages), require steady and persistent effort. Last spring at the CDB Seminar I learned that there was a whole group of people who share what I initially thought was the wrong way of doing things. And it works for them, most of the time. Understanding this helped me let go of the need to organize, schedule and generally oversee my son’s life. It also helped my son identify his default work style. Over time, he will need to discover when his work style works for him and when it doesn’t so that he can be conscious about the need to modify it when circumstances require. I’m not really sure I can help him with this. As flexible as he thinks he is, he’s not really interested in trying things my way. In the meantime, I’m hoping that any further insights he may gain will not involve a visit to the emergency room. Every gifted person has a unique story. The following story is part of a series of posts depicting the many faces of gifted by highlighting gifted children and adults we have found through IEA programs. The Caroline D. Bradley Scholarship program – mentioned in this story – awards highly gifted applicants with a four-year scholarship to a high school that fits their individual, intellectual and personal needs. 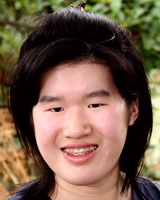 IEA’s Caroline D. Bradley (CDB) Scholarship was created with kids like Valerie Ding in mind. Read more of Valerie’s story here! Caroline D. Bradley Scholars spent the weekend learning about themselves, making connections, and exploring San Jose! 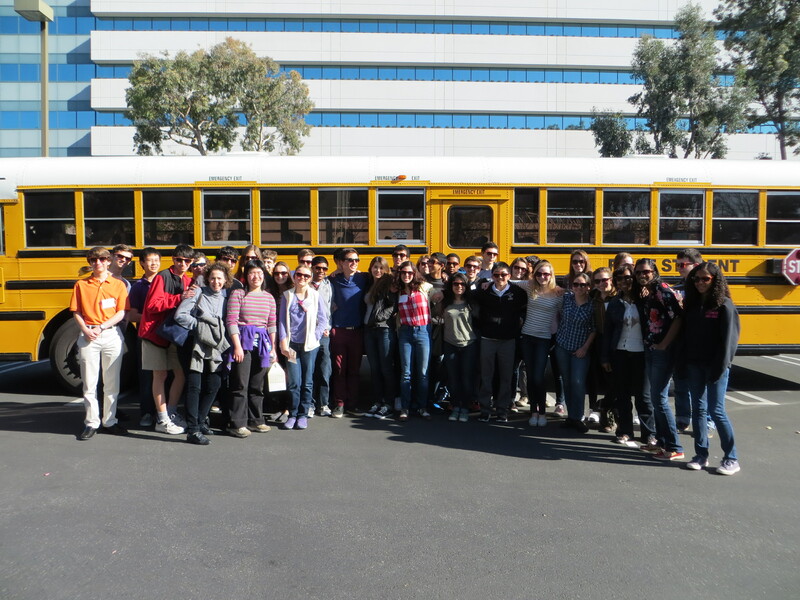 On February 22-24, 2013, we hosted the 10th annual Bradley Seminar in San Jose, California. The event, funded by The Lynde and Harry Bradley Foundation, provides an amazing opportunity for the Caroline D. Bradley Scholars, their parents, and alumni to come together each year for a three-day conference to discuss issues of global importance and personal relevance. Read more about what happened at the seminar here! Caroline D. Bradley Scholars, parents, and alumni met in Atlanta, Georgia, for the 2012 Bradley Seminar. March 23 – 25, 2012, we hosted our annual Caroline D. Bradley Seminar in Atlanta, Georgia. 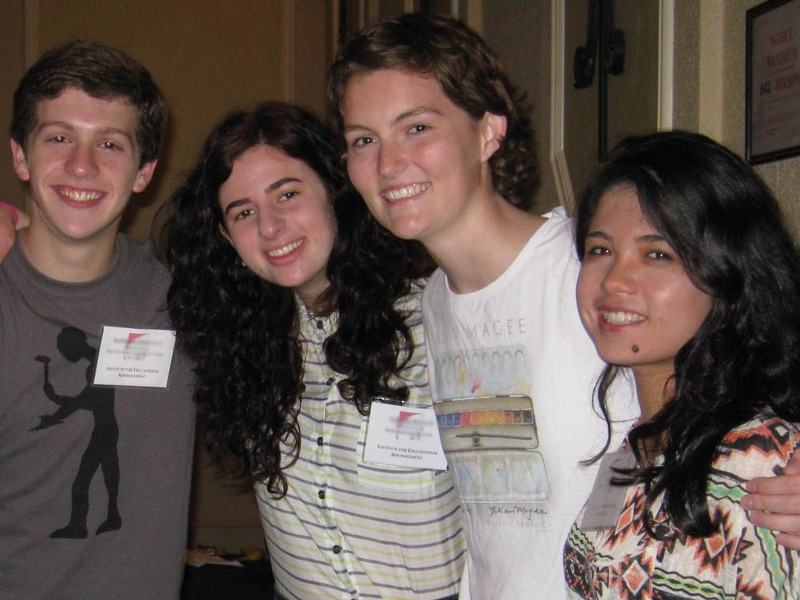 The event, funded by The Lynde and Harry Bradley Foundation, provides an amazing opportunity for the Caroline D. Bradley Scholars and their parents to learn and grow intellectually and personally in a unique community. Each Seminar deals with a theme that focuses on looking inward and challenging ourselves to grow, not only intellectually, but also personally. We all could benefit from time to reflect on things like core values, the importance of resiliency, good and evil, and how to open our minds to possibilities. Using the video “Leadership: An Art of Possibility” by Ben and Roz Zander as a starting point for the conference, the group discussed aspects of opening up your world to possibilities. One of the major points of the video was to “quiet the voice in the head” – the inside voice that is always talking to us! “You are not prepared,” or “that was a silly thing to say,” or “really, you had to eat the whole thing?” all come from that voice. It was fascinating to hear what voices played in the heads of each age group. They really are not all that different. That was a revelation to many. Two prime ministers were discussing issues of state. A field aid enters the room franticly waving his hands. “Sir, I am sorry to interrupt but…” The prime minister stops his trusty aid and says, “Remember rule # 6.” The aid smiles and leaves the room. A few minutes later, another staff member enters the room clearly upset, hair disheveled saying, “Prime minister, I really need to speak to you. You see…” He, too, is stopped and told to remember rule # 6. 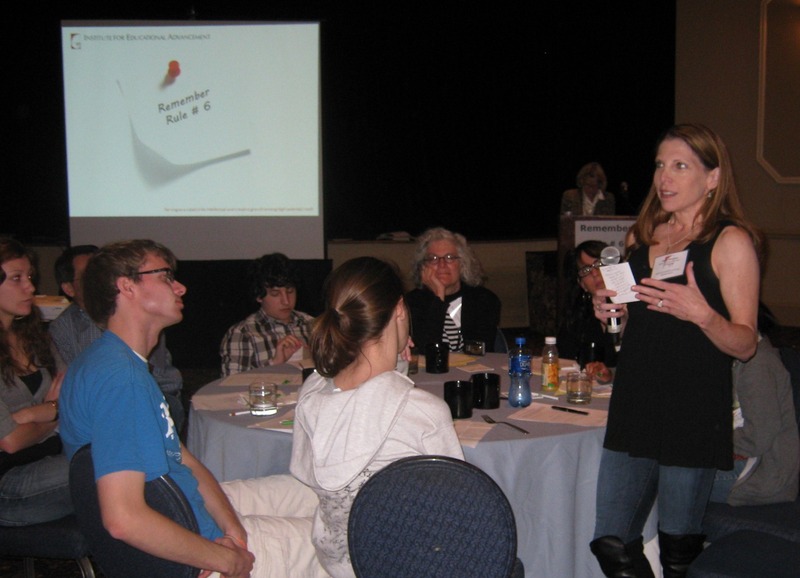 Attendees participated in cross-generational discussions about possibility, including rule #6. I am always amazed at the caliber and depth of discussion at the Seminar. Adults and kids alike ponder life-changing or affirming issues. These discussions among future thought leaders provide a foundation that builds confidence and tolerance. Over the weekend we discussed how to examine old assumptions and explore new ways to approach familiar situations. We reflected on how to quiet the negative voice in the head and to remember rule #6. Armed with these and other tools, participants left realizing they have the ability to reshape or rewrite their future. Often that means stepping into unfamiliar territory and taking a risk. If we can let go of unproductive habits – open up our mind, our heart, and our will to new possibilities – we can impact who we are and strive for what is possible, not just what is likely. It takes looking at something in a new way and being ready for the future. I believe the importance of this concept is that it not only articulates what a leader should do, but also who the leader is. We have been given a gift of a country filled with bright young minds. Teach them to think. Help them embrace all that is possible. Get gifted news delivered to your inbox!